For those of you that don’t know, Whistler recently built the world record breaking Peak to Peak Gondola that connects the peak of Whistler Mountain to the peak of Blackcomb Mountain. It has since become a major attraction for British Columbia tourism, attracting visitors to the mountain resort year round. 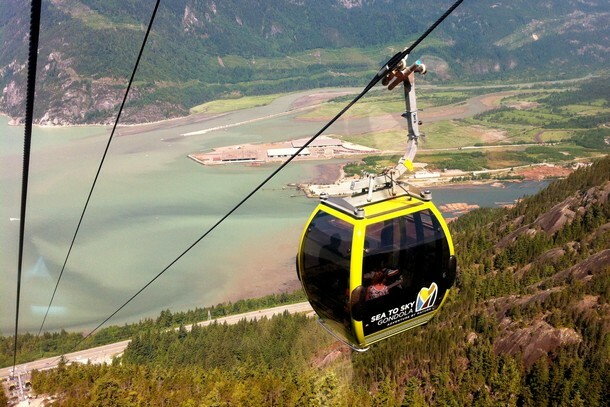 I’ll be honest, I couldn’t see the vision for the Sea to Sky Gondola project and questioned whether it would succeed in attracting enough visitors to make the significant investment worthwhile. 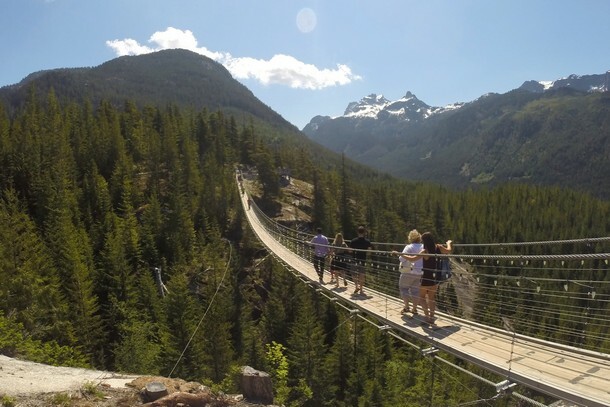 Located about halfway between Vancouver and Whistler, the town of Squamish is continuously building its brand as an outdoor adventure destination, but it’s not an easy task with the former Winter Olympics venue located down the road. We don’t spend a lot time in Squamish. In fact, aside from a quick gas station break or occasional hike to the peak of the Stawamus Chief (the most recognized mountain in Squamish), we mostly just pass through on our way to Whistler. 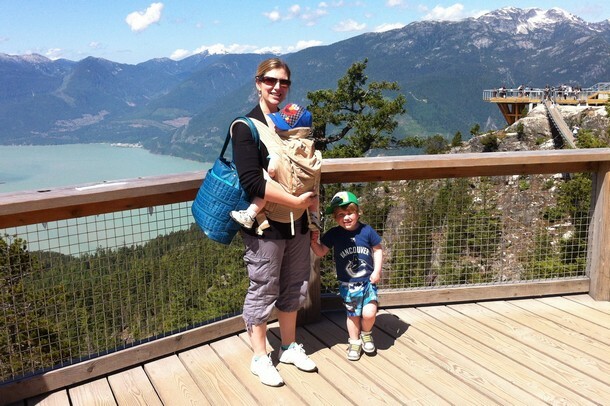 That changed last week when we visited Squamish’s shiny new outdoor attraction. 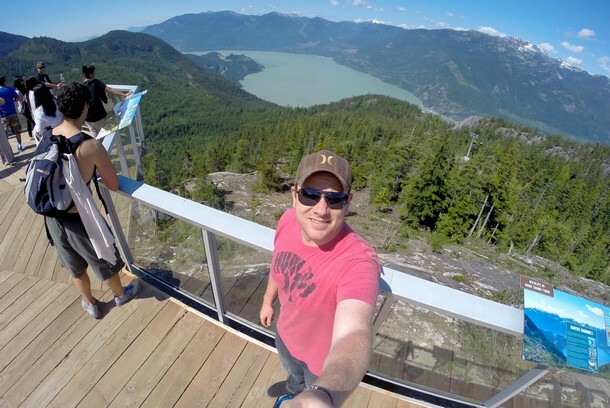 We’ve made it a priority to spend more time exploring our big beautiful backyard this year, so we decided to visit the Sea to Sky Gondola while on en-route to Whistler for a weekend retreat. We arrived at the base of the gondola around 10:00 AM, which is important to note because by the time we left at 1:00 PM the free parking lot was completely full. It was a sunny Saturday in late May, so I’m not sure if this is the norm. 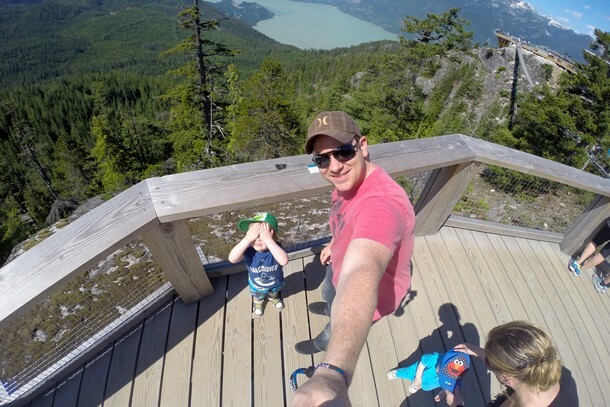 Regardless, if you plan to visit the Sea to Sky Gondola on a weekend in the summer, make sure you arrive early because it’s become quite a popular attraction and parking is limited close to the entrance. 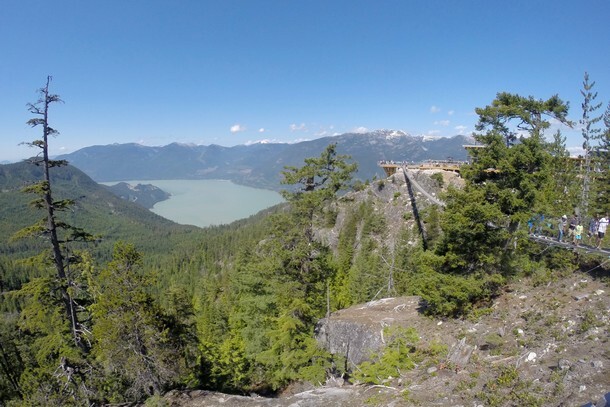 There’s overflow parking available across the highway from Shannon Falls Provincial Park. We’re told that there’s a free shuttle service on the weekends. Or, you can walk 15-minutes to the Gondola through the connector trail. Our boys really enjoyed the ride up and down the gondola. 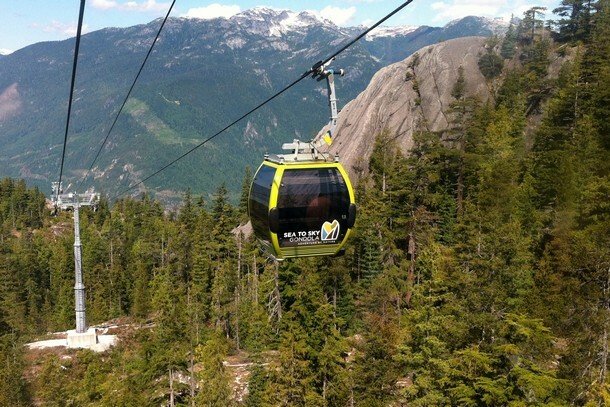 The comfortable 8-seat gondolas are mostly windows from top to bottom, offering panoramic views of Howe Sound and the Sea to Sky Highway below. Even on a busy Saturday we didn’t have to wait more than 2 minutes to catch our ride. We were pleasantly surprised at the length of the gondola ride. Initially, we thought it was just a quick trip to the first crest, but the summit is much higher than expected. It takes about 10 minutes from base to top, traveling 885 metres above sea level. As we approached the Summit Lodge and viewing deck, we were impressed by the level of investment put into this outdoor attraction. It’s a beautiful facility with huge Douglas Fir beams and massive glass windows, giving it the quintessential Pacific Northwest vibe similar to that of Whistler. 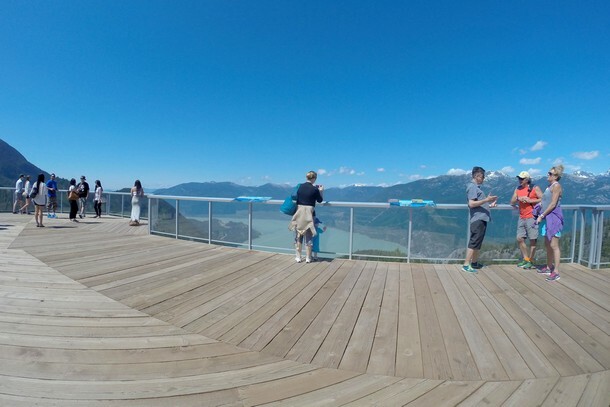 The large viewing deck provides outstanding views of the blue-green waters of Howe Sound and the lush Squamish Valley. 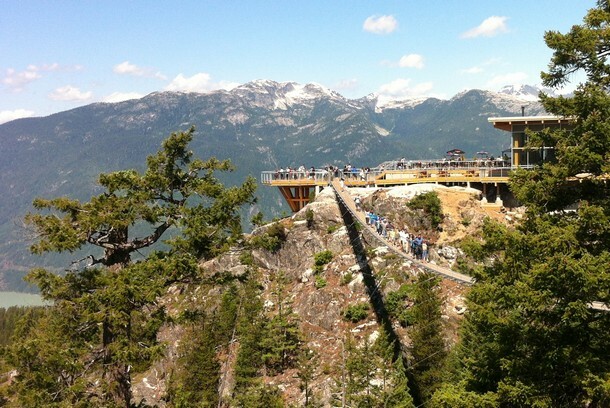 There’s another viewing area called the Chief Overlook Viewing Platform, accessed by the 1.6-kilometre Panorama Trail. We skipped this one because we weren’t sure how our little ones would handle the hike, though we’re told it’s an easy trail that’s more of a walk than a hike. I recently purchased a monopod for my GoPro camera and tested it out for the first time that afternoon. I’m still trying to get the hang of it, but so far I like it. Here’s a link to the product, in case you’re interested. 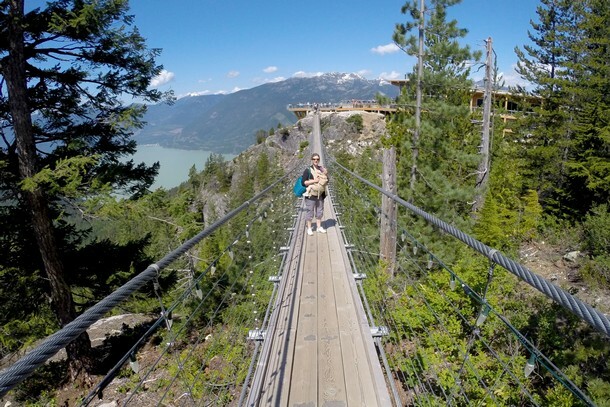 The Sky Pilot Suspension Bridge connects the Spirit Trail/Spirit Viewing Platform to the Summit Lodge Viewing Deck. 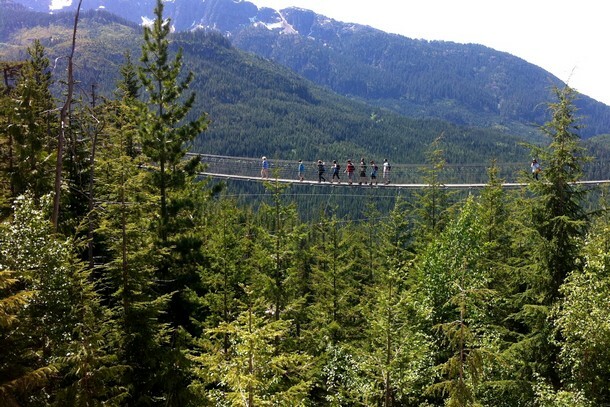 The bridge is approximately 100 metres long and is a must do for anyone visiting the gondola. I have a mild fear of heights, so crossing the bouncy suspension bridge while holding my camera in one hand and Braydon in the other was quite nerve-raking. 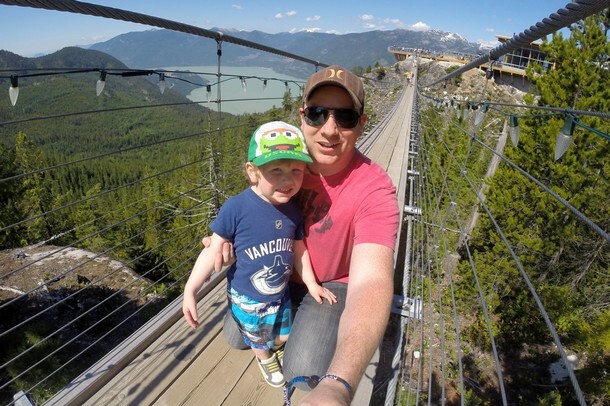 Fortunately, it doesn’t appear Braydon has a fear of heights at all… he would have run across the suspension bridge if I let him! We didn’t trust Connor’s wobbly toddler legs walking across the suspension bridge so we strapped him into our Onya Baby carrier to be safe. Like his brother, Connor would have run across the bridge if we let him, but it has too many open areas for our liking. 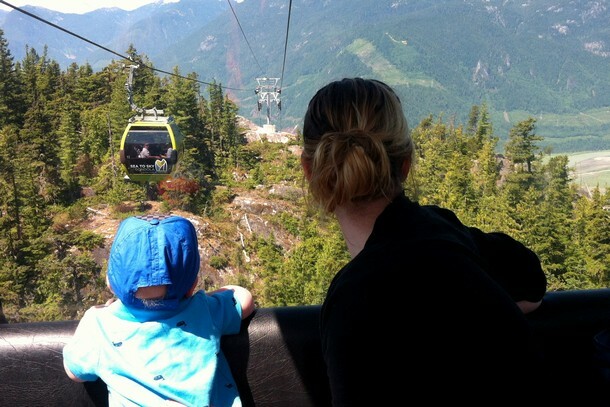 We really enjoyed our Sea to Sky Gondola experience. 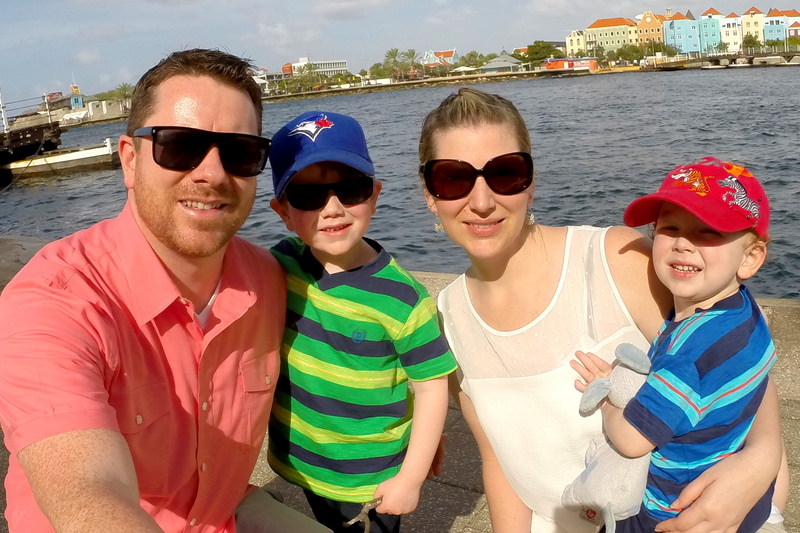 We’re glad we made the stop and will certainly return again in the future. It’s a fun place to spend the day and it’s very family friendly (children under 5 years old are free). 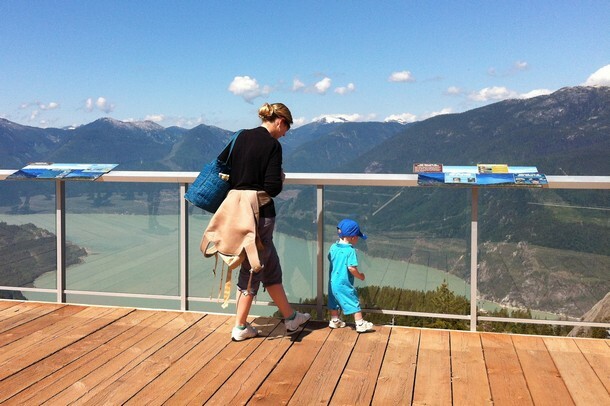 Even if all you do is take the gondola and have lunch on the sundeck, it’s an ideal day trip from Vancouver. There’s a cafeteria-style restaurant inside the lodge that serves sandwiches, salads, snacks and baked goodies. Or, you can sit back and enjoy a cold beer while taking in the spectacular views. Although I failed to see the vision for the project prior to it being built, I totally get it now. 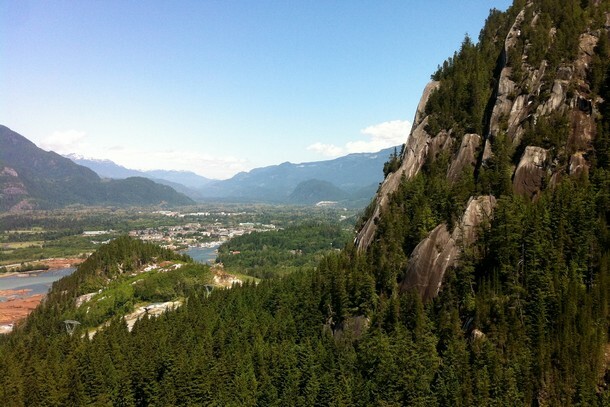 It’s a great addition to Squamish and the never-ending list of must-visit British Columbia tourist attractions. There are dozens of hiking trails at the summit, so we can see ourselves introducing our boys to the easier trails over the next few years. And, for the more adventurous hiker, you can hike from the base to summit – here’s some info about the trail. 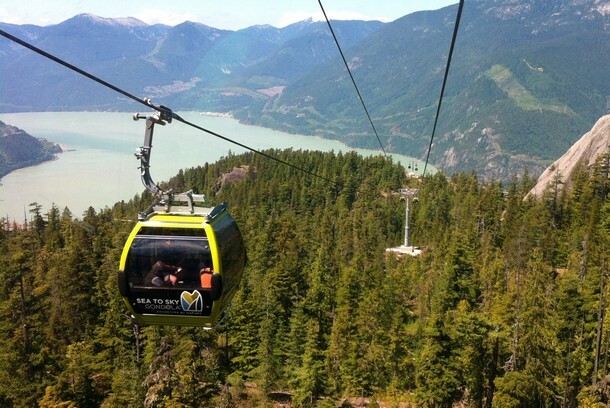 Have you visited the new Sea to Sky Gondola? What did you think? 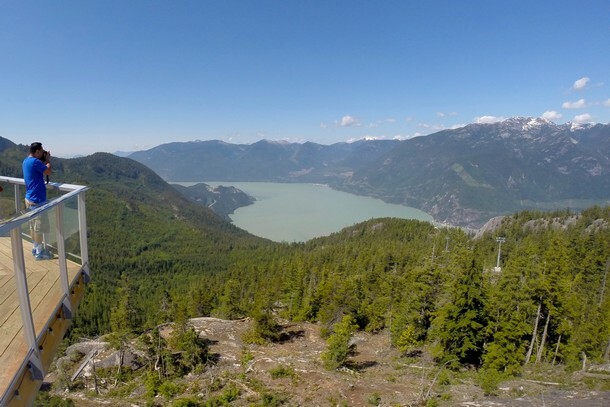 Here’s a great video that gives you a different perspective of the Sea to Sky region. 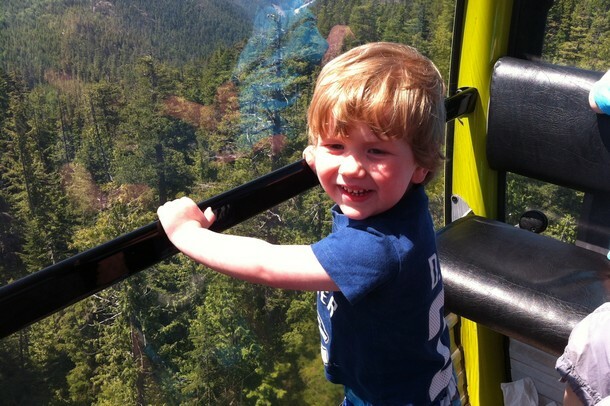 Our Sea to Sky 2014 from Sea to Sky Gondola on Vimeo. Looks great! I’m always a bit suspicious of places like this that appear that have been built just as a tourist attraction and not because there’s any real reason to go. But it seems like you’ve investigated it and it’s worthwhile. Appreciate the tip! Wonderful photos. Glad you like using the GoPro! I’ve been thinking about grabbing one for a travel art project in the next year or so. I love this place the views are amazing!